Time for some stripe action! I really wanted to use a glitter polish I had purchased recently on sale at Trade Secret, so I created this look and it kind of reminds me of a nicely wrapped present using fancy glitter wrapping paper (if that exists). 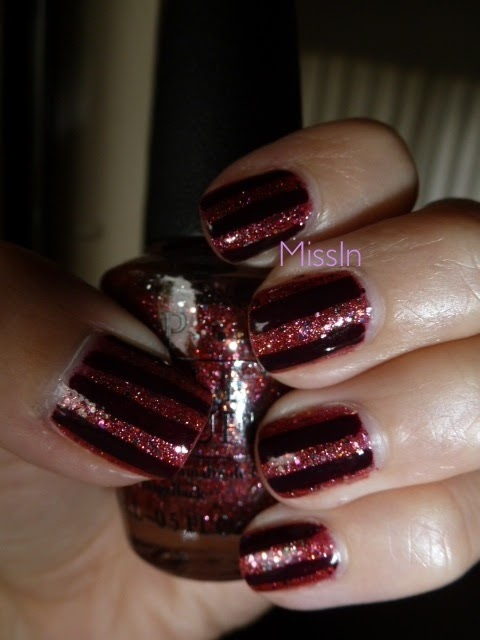 For this design I used two coats of OPI Excuse Moi! 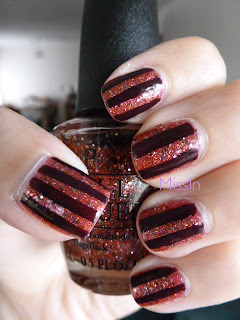 then OPI William Tell Me About OPI to make the stripes. This picture is taken with natural light. This picture was taken with flash (sorry for the darkness, I'm still fiddling around with the flash). I wanted to show more the depth of the glitter polish, isn't it pretty?? I love the colour!